This textbook was written with two primary objectives. The first is to introduce the C programming language. C is a practical and still-current software tool; it remains one of the most popular programming languages in existence, particularly in areas such as embedded systems. C facilitates writing code that is very efficient and powerful and, given the ubiquity of C compilers, can be easily ported to many different platforms. Also, there is an enormous code-base of C programs developed over the last 30 years, and many systems that will need to be maintained and extended for many years to come. The second key objective is to introduce the basic concepts of software design. At one-level this is C-specific: to learn to design, code and debug complete C programs. At another level, it is more general: to learn the necessary skills to design large and complex software systems. This involves learning to decompose large problems into manageable systems of modules; to use modularity and clean interfaces to design for correctness, clarity and flexibility. 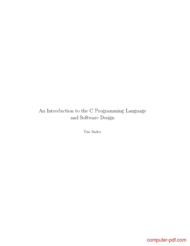 Description : Download free An Introduction to the C Programming Language and Software Design course tutorial, a PDF file by Tim Bailey. It is never too late to start learning and it would be a shame to miss an opportunity to learn a tutorial or course that can be so useful as C Programming Language and Software Design especially when it is free! You do not have to register for expensive classes and travel from one part of town to another to take classes. All you need to do is download the course and open the PDF file. This specific program is classified in the C-C++ language category where you can find some other similar courses. Thanks to people (like you?) Who share their knowledge, you can discover the extent of our being selected to easily learn without spending a fortune! 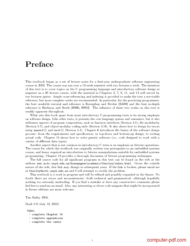 C Programming Language and Software Design. is available for free by its author. But also many other tutorials are accessible just as easily! The latest news and especially the best tutorials on your favorite topics, that is why Computer PDF is number 1 for courses and tutorials for download in pdf files - C Programming Language and Software Design. and C-C++ language! Download other tutorials for advice on C Programming Language and Software Design. you will see! We will do everything to help you! And you dear surfers what you need? The best course and tutorial, and how to learn and use C Programming Language and Software Design. of course!